In contrast to webmail clients like Gmail or OWA, Microsoft Outlook’s default behavior is to embed images in email signatures instead of only linking to images hosted on the Internet. While linked images have several downsides (discussed in this article), they can be used in cases where e.g. reducing the size of the email is a priority. Below you will find the steps necessary to override Outlook’s default behavior and force it to use a linked/internet image. and change the Send Pictures With Document value to 0. The rest of the procedure is identical as in Outlook 2013: in the signature editor position the cursor where you want to insert the picture, click the Insert Picture button, provide the full URL of the image, click the downward arrow next to the Insert button and select Link to File (see above for more). Now, when editing your signature, position the cursor where you want to insert the image, right-click to trigger the context menu and select Insert Image…, in the resulting window provide the full URL of your image in the Picture Source: box and click OK. This entry was posted in Microsoft Outlook 2003, Microsoft Outlook 2007, Microsoft Outlook 2010, Microsoft Outlook 2013 on December 1, 2014 by Adam the 32-bit Aardvark. These are clearly articulated steps. However, when I run the Registry Editor and open option 14.0 for Outlook I don’t get the Mail option, just Word. Anywhere else this might be? Hi Caroline, Just to confirm – you have Outlook 2010 on your machine and you expand 14.0, then expand Outlook, then Options, and the only entry you find is Word? 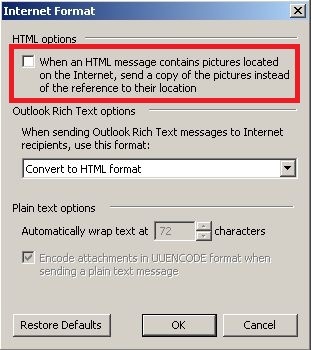 Hi Pawel, I did all the steps you mentioned above for Outlook 2010 but cant find “send pictures with document” only (default) and “receipt response”. How do I fix this? This is an excerpt from the above link (https://support.microsoft.com/pl-pl/kb/2779191) you provided. For Microsoft Outlook 2007 and 2010 if the “Send Pictures With Document registry value” is not there you do not have to do anything. But if it is not working for you then add the value and set it to 1. Remove the Send Pictures With Document registry value, or change the value of Send Pictures With Document to 1. Paweł, I just realized in your original post above you state: “change the Send Pictures With Document value to 0.” Than in the reply to Nathasia you state: “change the value to 1.” . I also added a reply a few minutes ago (5.34pm) stating: “set the value to 1” based on the MS article link you provided: https://support.microsoft.com/pl-pl/kb/2779191. Now I’m confused. Would you please clarify for me and readers? I can’t find internet linked image for Outlook 2016 Mac? Do you have any idea for this? Hi LOOI, Try this solution: http://www.enterpriseosx.com/outlook2011-problem-images/. Note, that to produce an internet linked image the value should be 0. I get a bunch of options once I choose link to file (Outlook 2013). It asks to convert file from, with a lot of different options. I tried jpg just to see and it rejects it. Hi James, Can you post a screenshot somewhere on the web of the options you get? Hi Pawel, im experiencing the same issue with outlook 2010. It seems to want to convert the url link to a recognizable format like JPEG, metadata or other formats. I’m unable to recreate this problem. It would help greatly if you posted the screenshot Paweł requested. I’m using Outlook 2016. If I link to an online photo following your steps and change the photo (keeping the same path and name), my understanding is that the picture should change in my email. However it does not. Am I misunderstanding how it works or is there a difference in Outlook 2016? You are correct, if you change the image, keeping identical url and name, the image should change in the email. However, it does not apply to messages which have already been downloaded along with the pictures. You should not have edited the registry – starting from Outlook 2013, the default behavior has changed. Please make sure that you click the dropdown arrow next to the Insert button. Clicking the Insert button itself does not work.